Bacterial infection in the gums or dental plaque can occur from improper cleaning and improper preventive measures or any number of health problems. Researchers generally believe that there is a definitive link between your mouth’s health and the health of your entire body from a wholistic standpoint. 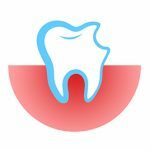 Periodontal disease (or gum disease), whether from a buildup of plaque or of harmful bacteria, can start with symptoms such as bleeding or swollen gums and, if left untreated, can lead to calcification, various types of gum disease, or other issues which can fundamentally harm the structures that support your teeth. With routine professional cleaning, done by trained professional Dentists and Dental Hygienists such as those at The Dalles Dental Care center, your risk of Gum Disease can be radically reduced. In addition, we can help inform you and your family on the absolute best routines and procedures that you can implement on a daily basis while at home to ensure that harmful plaque buildup is minimized and in-mouth harmful bacteria are properly cleaned and treated. Whether you are in the preventive stage or the treatment stage, the Dalles Dental Care has all the implements, tools, and knowledge to help you treat and prevent Gum Disease in all stages of your life. A healthy mouth is a happy mouth. Let the professionals at The Dalles Dental Care help you obtain your healthiest and happiest mouth ever. Call, e-mail, or stop by today! "From the moment I spoke with the most friendly and helpful receptionist I knew this was going to be a positive experience. They offer in house insurance that actually makes going affordable and easy on the budget. Dr Easling is very professional and thorough dentist, explaining every detail I needed to know about my teeth. The hygienist was one of the BEST ever. She took her time yet got the job done in a timely manner. Again the education was invaluable yet all this was without making me feel that I was being lectured about any lack of care. I can't say enough good things to describe the positive polite professional and enjoyable experience at the dentist! Thank you all"